This keto recipe is super simple, easy to make, and adds a great accent to any dessert. Sometimes, I’ll just whip up a batch of whipped cream and top it with nuts to conquer a sudden sweet tooth. I can have it ready in less than three minutes with only three ingredients, and it’s much healthier and more affordable than its processed copy-cats you find at the grocery store. 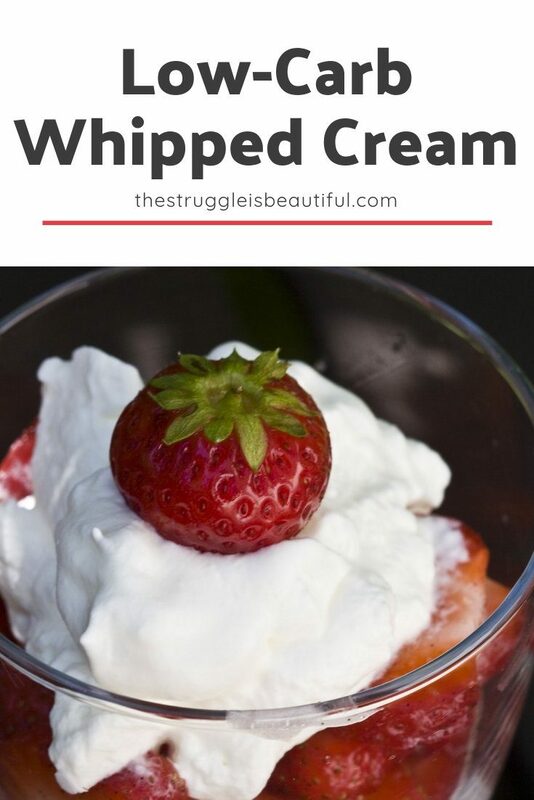 I hope you enjoy this Low-Carb Keto Whipped Cream as much as I do! The whipped cream you buy from the store is often made with vegetable oils and preservatives that cause inflammation and cravings. When you make your whipped cream at home, you know exactly what ingredients you are using. Next time your in the store, pick up one of those cans of whipped cream, and read the ingredients list. I’ll wager that half of the ingredients don’t even sound like food. You will be surprised how easy it is to make these simple things at home from whole foods. I like to use the Swerve (erythritol) sweetener, because it tastes so similar to sugar, without any of the carbs or calories. If you have a natural sweetener that you prefer like Stevia, feel free to use it instead. You will have to play around with the amount to add, and just sweeten it to taste. You will also need a mixer with a whisk attachment. It is possible to do with a regular hand whisk, but it will take quit a bit more elbow grease. I prefer the lazy way to make this recipe. This is the exact hand mixer that I used in the video. It’s cheap, works well, comes with multiple attachments. I’ve had it for months, and it’s still going great, but it isn’t so expensive that I would be upset if it happened to break. Since making the video, I bit the bullet and bought a KitchenAid. It was “love at first whip.” It makes my whipped cream super creamy, while keeping my hands free to work on other tasks around the kitchen, like making these awesome brownies to put my whipped cream on top of. First, whisk the heavy whipping cream until it has the consistency of whipped cream. This takes a little over two minutes with my hand mixer, less with the KitchenAid. Next, gently stir in the vanilla and the swerve. This is the simplest recipe ever, and so delicious. It literally takes three minutes! My kids eat it this low-carb keto whipped cream straight out of the bowl, and never know its not loaded with sugar. This simple 3-minute, 3-ingredient Keto Whipped cream is much better than store-bought versions. It's quick, easy, and perfect for low-carb diets. 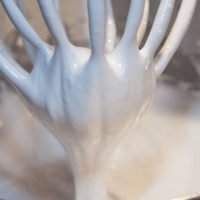 Whisk heavy cream with mixer until “whipped” consistency. Fold in Vanilla and Confectioners Swerve. The uses for this recipe or limitless. You can use it to top cake or pie, eat alone, or even put it in your coffee. I love using it to top my No-Bake Cheesecake. Let me know how you use this recipe in the comments below. I love hearing your combinations. If you’re interested in healthy cooking, I have compiled a great resource library of shopping lists, seasoning blends, and printable recipe cards. Sign up below to gain access, and to get my weekly emails full of tips and tricks to having a healthy diet without all the stress. Usually around the 5th day, mine starts to dry out. The tighter seal you can get in it, the longer it will last. This was so easy and taste incredible, I love flavor so I just tweaked it a little with a small amount of butter flavoring and little of ? flavoring, it is so good, thank you!!! That sounds absolutely delicious! I’m glad you like it! My name is Aly and I would like to know if you would have any interest to have your website here at thestruggleisbeautiful.com promoted as a resource on our blog alychidesign.com ?